There's nothing like shopping online knowing that you'll get great customer service, on-time delivery and free purchase protection. And because we want this experience to be everyone's, today we’re rolling out a set of improvements that will make it even easier for merchants to join Google Trusted Stores, our program that has helped thousands of merchants gain their customers’ confidence. Google Trusted Stores is a free certification program to highlight that you offer a consistently great shopping experience. Once qualified, your store will be recognized with a badge that is displayed on your site and on Google Shopping. Your customers will be offered free purchase protection by Google after making a purchase on your site, covering eligible orders up to $1,000. Applying to become a Trusted Store is now simpler than ever. You only need to create an account and add two snippets of code to your website. You no longer need to submit shipment and cancellations feeds, and you’re now able to specify a custom position for the Trusted Stores badge on your site and display it on HTTPS pages. Reviews collected through Google Trusted Stores help you qualify for seller ratings, which show on your AdWords text ads and Google Shopping. This integration provides shoppers with helpful information, while giving you a free way to earn the rating you deserve. 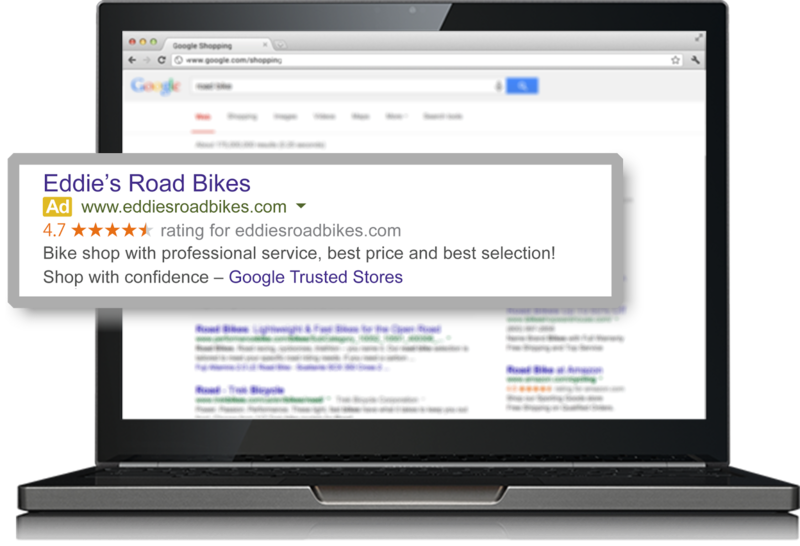 You can also enrich your AdWords ads by displaying your Google Trusted Stores status through a review extension. Review extensions are displayed on a separate line in your AdWords ads and may increase their clickthrough rates. Many partners are already enjoying the benefits of participating in the Trusted Stores program. For example, John Fitzgerald, Director Digital Marketing at Beau-Coup, told us "Our participation in the Google Trusted Stores program has resulted in increased traffic to Beau-coup.com as well as higher sales. 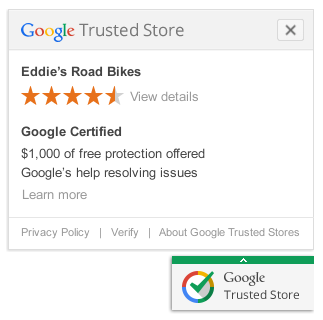 The Trusted Stores review extension highlights our status in AdWords, bringing more customers to the site, and the Trusted Stores badge gives shoppers confidence resulting in higher conversion rate overall." We made these changes available internationally in the UK, Germany, France, Australia and Japan a few months ago and hundreds of merchants have become Trusted Stores in these countries already. The Google Trusted Stores program is free and easy to set up, making it ideal for any merchant, large or small, interested in boosting shopper confidence. If you want to join the Google Trusted Stores Program, apply here. to all Product Listing Ad (PLA) advertisers to offer a more streamlined, retail-centric advertising experience. This year, we want to continue to help you make the most of your PLA investment. I will be on time. Keeping track of all your meetings, appointments, and social events is crucial to making sure you get the most out of your day. But while you’re managing your personal tasks, don’t forget to plan ahead when updating your product data -- it’s key to ensuring your products show on Google. Make sure to check the Google Shopping policies and act quickly in response to any notifications or warnings you may receive; you can even put a reminder on calendar and list out steps to resolve a warning before the specified deadline. With time to spare, rest easy knowing that you’re in tip-top shape to take full advantage of every opportunity to reach more shoppers, when it counts. I will get organized and eliminate clutter. You’ve just made it through the hustle and bustle of the holidays -- and your home, nerves, and work are probably still reflecting it. Relax -- it’s a new year, and it’s time to get things back under control. Part of reaching that “zen” state is making sure your product data is up-to-date. With the help of automatic item updates in Google Merchant Center, dynamically update product price and availability shown on PLAs if there’s a difference between your data feed and your website’s microdata. This will help you seamlessly update your ads and avoid disapproval from mis-matched information; in fact, merchants who have opted in to this feature have seen a 50% reduction in price-related item disapprovals. I will try something new. Did 2014 have you feeling like you were stuck in a rut? This year, break free from your standard routine and get inspired. Learn a new language, pick up a paintbrush -- or try out new Google Shopping features to help you reach even more customers across screens this year. As consumers are turning more and more to their mobile devices to shop on-the-go, the new Auction Insights report can help you better understand your mobile impression share and see how you stack up against the competition. On Black Friday of 2014, we saw a 3.5x increase of people searching for products on mobile year-over-year. By analyzing your performance on mobile, you can optimize your mobile bid modifier as necessary to reach your shoppers, wherever they’re searching. I will be a better listener. No texting during dinner. No talking over others. And no more ignoring key Shopping insights. Just as listening to your friends and colleagues can mean more opportunities to develop better personal relationships, listening to your campaigns can help you nurture better results to sell more of your products. Check out a handful of tools we have for you to stay in tune with the health and performance of your campaigns, including the Diagnostics tab in Google Merchant Center to ensure that your data is free of issues, or the Search Terms report to help you identify new opportunities to optimize your titles and descriptions, based on how consumers are searching for your product. I will be a better communicator. Just as listening can be an important part of developing stronger relationships, so can communicating. Regardless of the type of relationship, from friendship to family to job-related, the better you are at communicating, the more successful that relationship is likely to be. Foster an open dialogue with us by double-checking your contact information in your Google Merchant Center account; this will ensure we continue to send updates and alerts to email aliases that are actively monitored, so you don’t miss out on important details. Here’s to Shopping success in 2015! We know that retailers are always looking for the best ways to promote their products and reach shoppers online in the exact moment they’re looking to buy. Our mission with Google Shopping is to help you do that. In 2014, we introduced Shopping campaigns to all Product Listing Ad (PLA) advertisers to offer a more streamlined, retail-centric advertising experience. This year, we want to continue to help you make the most of your PLA investment.